Want us to let you in on a little secret? 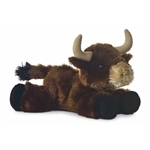 Aurora Mini Flopsie stuffed animals are awesome! These small stuffed animals measure anywhere from six to eight inches and come in all kinds of animals. Their small size and affordable price, Mini Flopsies are only $4.99, make them the perfect choice for stocking stuffers, party favors, gift bags, and promotional giveaways. With bean-weighted bodies and lock washer eyes, Mini Flopsies are durable and safe but more importantly, they're adorable and fun. Dog lovers will howl over the fabulous selection of Mini Flopsie plush dogs like Shep the German Shepherd and Cutie the Stuffed Yorkie. Cat lovers, don't worry, you're covered too! There are several Mini Flopsies plush horses, wild cats, and aquatic animals as well. All of your favorite North American animals come in a Mini Flopsie version, like Liberty the Stuffed Bald Eagle and Woolsey the Stuffed Wolf. If you feel like really going nuts over a stuffed animal, check out Nutty and Nutsie. It's easy to see that there is a Mini Flopsie for all occasions but what about 100 or 1000? Don't worry, just give us a call and we'll help you get all of the Aurora Mini Flopsies that you need. Schools, businesses, churches, and other organizations commonly use these adorable plush animals for all sorts of events and celebrations with amazing results. Plus, most of the Mini Flopsie stuffed animals are available with customizable bandanas so that you can properly commemorate your occasion. It's not a party until the personalized plush animals show up! If Mini Flopsies know one thing, it's how to bring the fun. So now that the secret is out, join in the fun and start your very own collection of Mini Flopsie stuffed animals by Aurora.